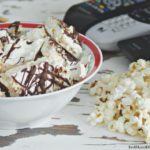 My Smoky Sweet Popcorn Bark is the perfect accompaniment to a big bowl of Pop Secret popcorn and the chance to enjoy a movie with my teenage daughter. Starting this Friday, my kids will be on holiday break for almost three weeks. I hope to take the time to reconnect with my teenage daughter. Being a dad you really have no clue what you are in for when you have a daughter who starts growing up on you. For the first 11 years she is your little princess and you are her hero. Then something happens and there is a different person living in my house, who I do not recognize. It’s even worse when we have the same personality. Boys, hormones and a dad who doesn’t have a clue on how to handle any of this. So while the kids are off, I am going to try to be calm, engaging and hope to reconnect and relax with my beautiful teenage daughter. 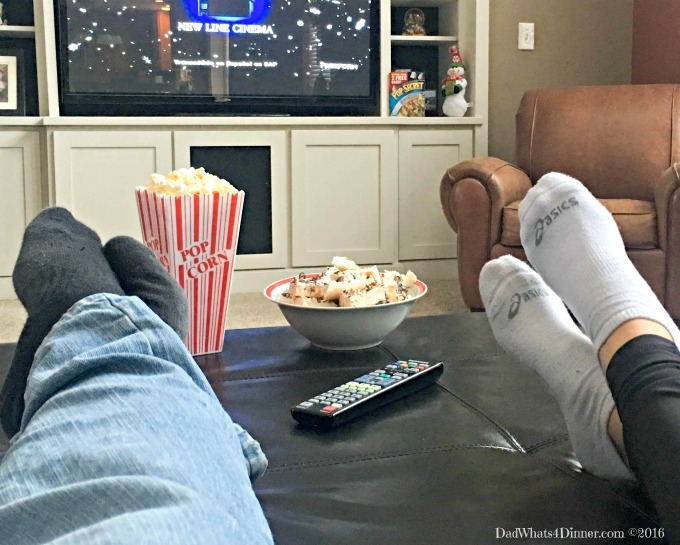 Luckily we both love movies and popcorn, so there is a starting point. I was at Walmart the other day stocking up on snacks and food to keep the kids happy over break. I also picked up two 10+2 packs of Pop Secret popcorn. I love the homestyle and my daughter loves movie theatre butter. I also picked up the ingredients to make my awesome Smoky Sweet Popcorn Bark. 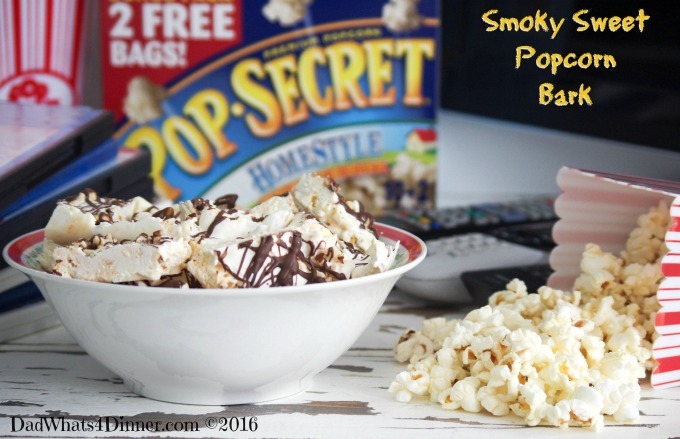 I made my Smoky Sweet Popcorn Bark because I know she will enjoy all these flavors along with a big bowl of Pop Secret Popcorn. This is a super easy recipe and I added some smoked paprika to enhance the flavor and to coincide with the upcoming debut of the new movie Assassin’s Creed which was filmed in Spain. Make sure you spend some time over the holidays with your kids by listening to their wants and needs. 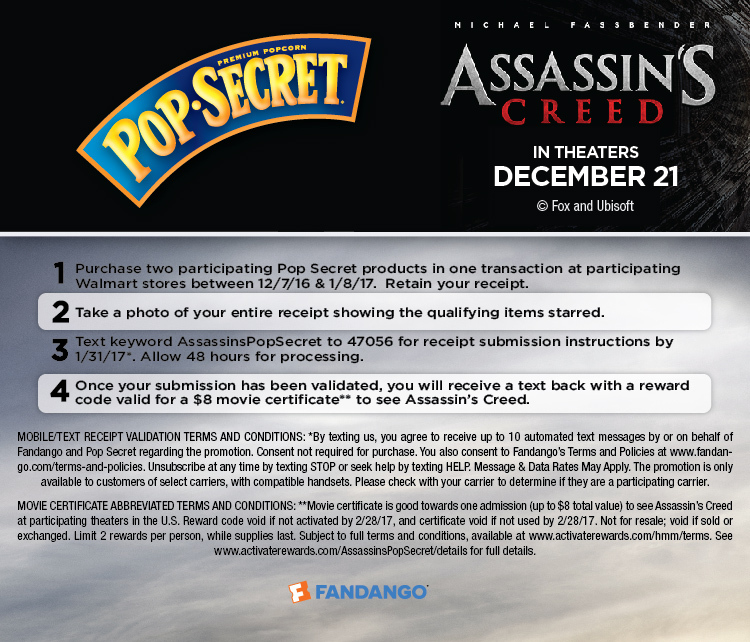 I hope you get a chance to take advantage of the great offer by Pop-Secret and Walmart to save $8.00 on tickets to see Assassin’s Creed. Line a 9 x13 inch baking sheet with parchment paper so it overhangs the edges. Spread popcorn evenly on baking sheet. Place the white chocolate in microwave safe bowl. Microwave for 1 minute. Stir, and continue to melt in microwave at 30 second intervals, stirring after each until melted and smooth. 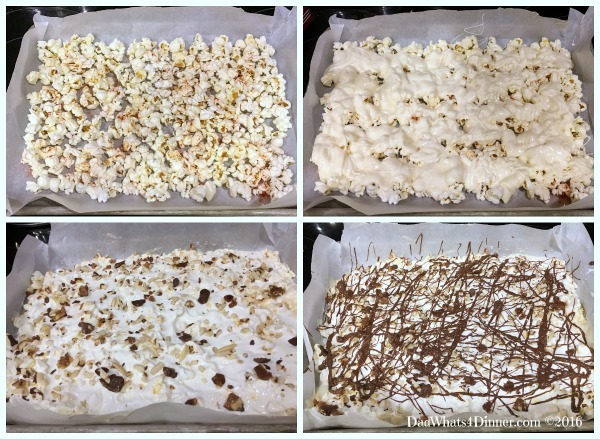 Pour melted white chocolate over popcorn and spread evenly. Top chocolate with almond toffee bits. 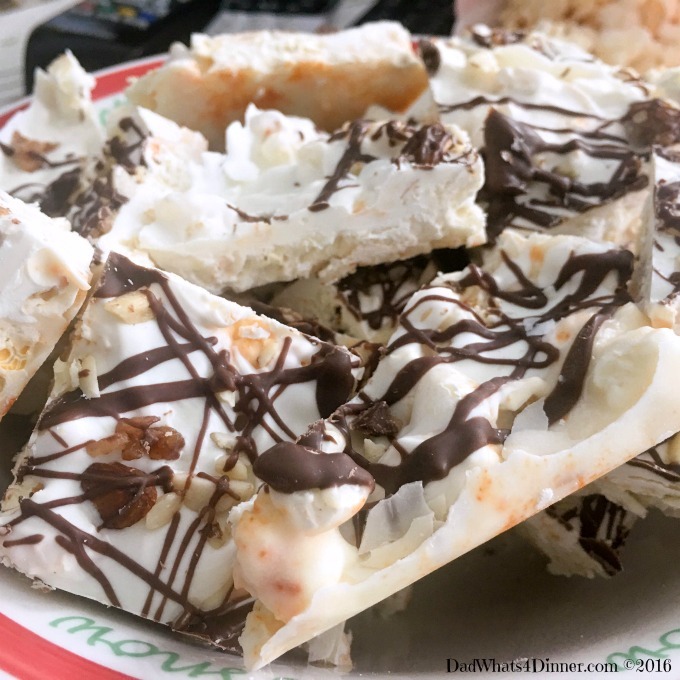 Melt chocolate bark same as above and drizzle on top. Refrigerate for at least 1 hour or until chocolate is set. Remove from pan and peel off the parchment paper. 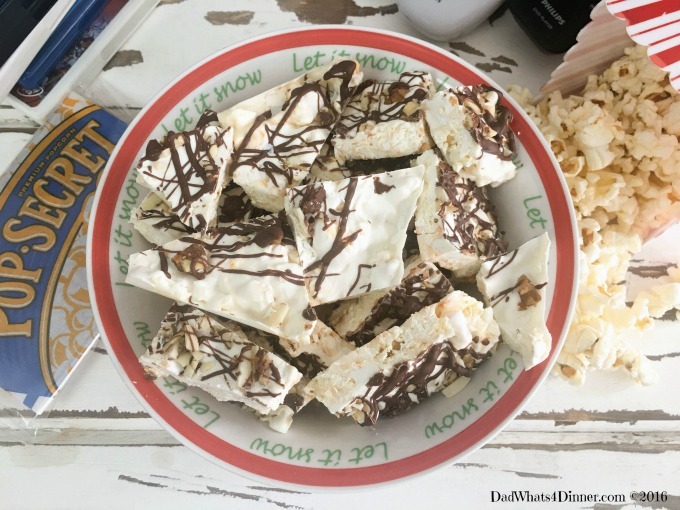 Recipe inspired by list Sweet and Salty Popcorn Bark from FoodNetwork. I will be bringing my Smoky Sweet Popcorn Bark recipe to Friday Favorites, Fiesta Friday, Weekend Potluck, What’s Cooking Wednesdays. Checkout my Link Parties page for other great places to find new recipes. 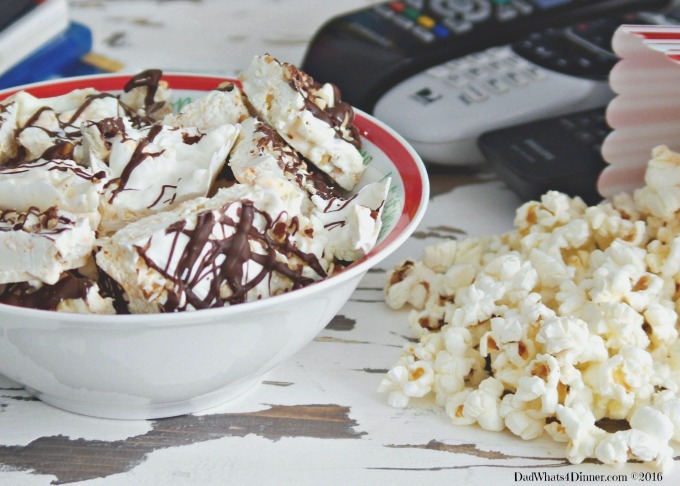 What a fun twist on popcorn I’m sure any teenager would like. 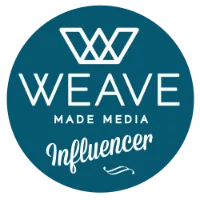 Love your take on connecting with your daughter – I remember those years from the other side! Thanks for sharing with Fiesta Friday. This sounds delicious! What a yummy and easy treat! Yummy this looks so good!!! I love bark. Me too and this is really good. Salty and sweet! I love this idea! 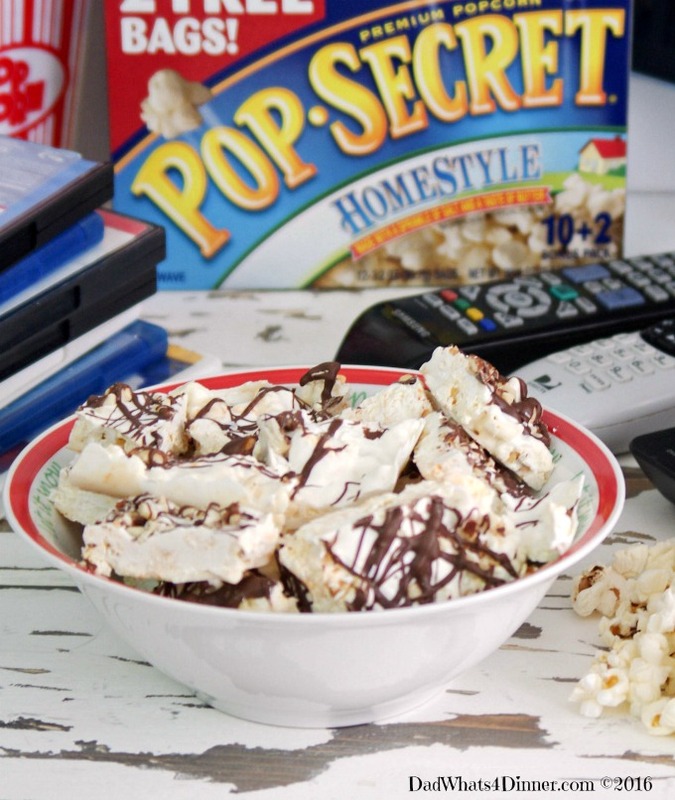 Such a great way to dress up popcorn. Thanks Kimberly. It was really good.